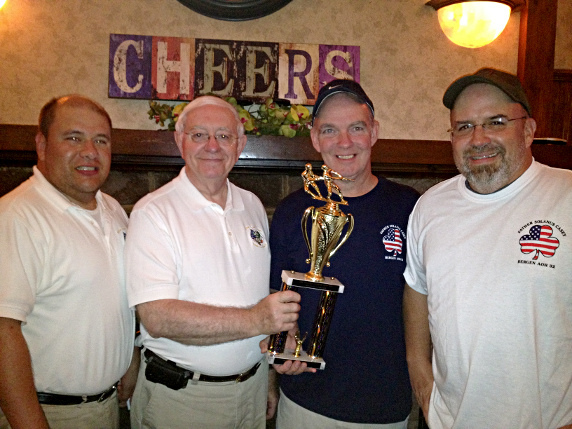 Pictured L to R: Sean Hughes, President Bergen 32 and NJ AOH Treasurer, John Hughes KofC Tank Pull Committee Chairman, John Connelly Founder, Former President Bergen 32 and Tank Pull Team Captain and Jerry DeTitta who’s union sponsored the team. Knights of Columbus Tank Pull Committee Founder and Chairman John Hughes awarded Bergen 32 Father Solanus Casey Division a 3rd place trophy for placing 3rd in overall fundraising. The KofC Tank Pull raised more than $60,000 for the Wounded Warrior Project and other local veterans charities. More than 30 teams competed in the competition including a team from Monmouth 2 AOH.